A one-bedroom apartment is often where adult life starts. This type of apartment can provide plenty of space for a young professional, fresh out of school, who is ready to take on the world. Of course, the apartments featured in this post tend towards the luxury and style that most recent graduates could never afford. 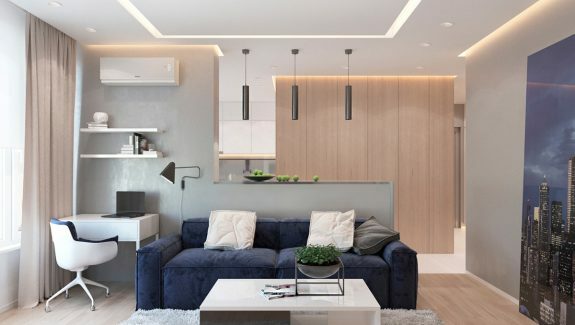 Instead, these sleek, sophisticated apartments use high-end materials to create timeless styles that are sure to impress any visitor while also allowing the occupants to themselves luxuriate in their own good taste. 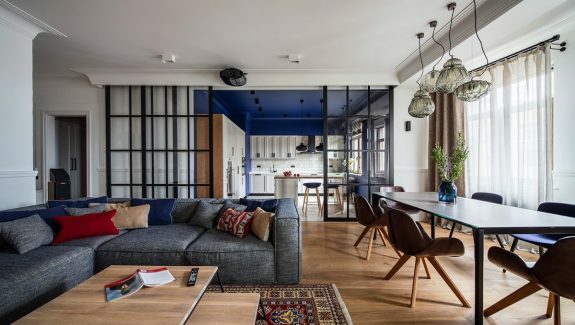 The first apartment is located in Kiev, Ukraine and measures in at 52 square meters (559 square feet). In the living room, a large plush sofa and matching coffee tables take center stage. The open floorplan plus the white and wood design palette make the space feel large while an indoor plant adds a pop of color. A tall, thin floor lamp is both a practical choice and stylish element. Simple kitchen stools in the white kitchen are the perfect place to sip a coffee or read the morning paper (or iPad). Oversized windows can be covered with a full-sized roll-down covering for better television viewing during the daylight. A design that keeps the closet in the open forces you to keep your closet organized, but the recessed lighting turns it into a chic focal point. The bedroom is not large, but the simplicity of the design and color palette make it seem much more open. In a cold climate, a unique fireplace at the foot of bed is the ultimate luxury. The white tiled bathroom also features recessed lighting for warmth. True, a white bathroom design is not a revolutionary choice, but with a large soaking pool and gleaming white fixtures, the results are stunning. The next home features an overall sleek design with a largely neutral palette, and measures 70.6 square meters (759 square feet). Function is the key to this overall design, from a simple reading chair to angular sofa and wall-mounted television. The while color that pervades most of the space serves to emphasize details, like the simple, modern coffee tables. A small wood paneled nook makes for a perfect home office area without taking up too much space. The office nook also works as a partial wall to separate spaces in this open floorplan. The kitchen embraces the same simplicity with its large island/cooktop and white paneled wall. The countertop island is a perfect place to grab a quick bite at any time of day. An undermount sink with a simple tap is both subtle and luxurious. In the bedroom, unique bedside lamps cast enough glow to read a book at bedtime while recessed lighting behind the bed is perfect for the morning. While wall paneling helps doors to disappear into the larger design. And we finish with another example of a sleek, white bathroom with flattering lighting and luxe fixtures. The final home offers a bit more in terms of color but still ultimately has a simple, modern feel. A rust orange sectional sofa and eye-catching black desk chair make for furniture focal points in the living room. At the home workspace, unique table lamps look a bit like art pieces while obviously serving a practical purpose. The sofa backs up against a kitchen countertop, effectively dividing the main living space. In the bedroom, dark wood paneling brings a warmth to the space. A modern shaped side table sits a bit far from the edge of the bed, but adds some artistry as well. The recessed headboard area makes the sleep space a bit more cozy. The bathroom uses a blend of marble, tile, and wood paneling. The wood is warm and adds a texture to the room. A marble sink and large mirror reflects the other angles of the room, making it seem bigger than it is. Black matte wall tiles and smooth marble are another exercise in contrast that works well. Depending on how the lighting is configured, the room can even seem as if it is different colors. Of course, a deep marble tub is the crowning achievement of this particular space.